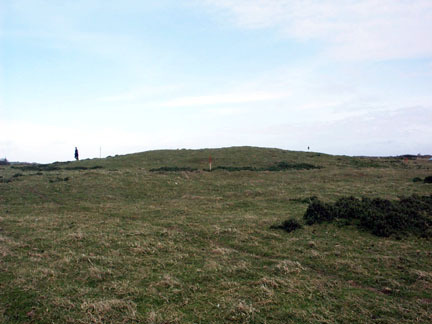 A field evaluation was undertaken at Brownslade Barrow, Castlemartin, during Spring 2003, accompanied by the osteoarchaeological analysis of unstratified human bone which was taken from the site in 2002. Brownslade Barrow is a low mound of sand, conventionally thought to be Bronze Age in origin. It was excavated in the 1880s when a large number of extended, oriented inhumations, some in stone-lined graves or cists, were uncovered, in addition to an earlier burial which may be Romano-British. The extended burials were assumed to be Christian. The site, which is scheduled, is under threat from badger activity, and as a preliminary to any mitigation works Ministry of Defence Estates commissioned Dyfed Archaeological Trust to undertake a topographic and geophysical survey of the site in 2002. A possible earthwork enclosure was identified immediately east of the barrow, into which the burials may extend. 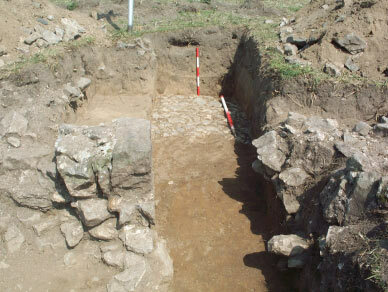 In addition, the remains of a small, oriented masonry building were recorded c.62m north of the barrow. This was tentatively identified as the possible late medieval chapel that had been noted during the 1880s. In 2003 a trial trench, again commissioned by the Ministry of Defence Estates, was dug at the east end of the building, shown in the photograph, but the results were inconclusive. No grave cuts, or evidence for liturgical features, were observed and the origins of the building as a possible medieval chapel were neither proved nor disproved. The bone assemblage is very well-preserved and of national importance. At least six individuals were present, three females and three males, ranging from a teenager/young adult through to adults of 40 years plus. In general it seems to represent a very healthy population. Five samples of bone, from three individuals, were radiocarbon dated. All dates fell within the early medieval period (AD 410-1100). The radiocarbon dates spanned 510 years, from cal AD 450 to cal AD 960, possibly representing burial within the 7th-8th century. However, the bone was unstratified and represents only a small sample. In addition, it is not known whether the bone was derived from the barrow itself or from the possible enclosure on its east side. The inferred development of the site from Bronze Age/Romano-British barrow inhumation, through post-Roman barrow inhumation and any burial within the apparent enclosure, to the establishment of the possible late medieval chapel, must remain inferential until a chronological burial sequence can be established. During the summer of 2005 the Ministry of Defence commissioned Dyfed Archaeological Trust to carry out an excavation on that part of the site damaged by the badgers. In addition to the funerary aspects of the site, evidence for agriculture dating to the first millennium BC was discovered in the form of ard (plough) marks. This evidence had been preserved and covered by sand dune formation between 200 BC and AD 500. The graves of the early medieval cemetery, 6th to 11th century AD, were dug into this sand. Approximately 38 graves were excavated. The well-preserved bones have been examined by osteo-archaeologists at the University of Lampeter, revealing some remarkable results. The oldest individuals found during the excavation were probably in their mid 50s when they died, and the youngest were infants less than a year old. The population displayed a number of medical conditions. Some, like arthritis in the older individuals, were to be expected. Others are much more unusual; some of the population display adaptations in their pelvises which may be the result of a particular type of repetitive movement, and would have produced an unusual walking gait. This is seen in both men and women, and is seen developing in a few of the juveniles. Work is on-going on the skeletal remains. The excavation was a complicated project to organise, due to the presence of the badgers (a protected species), unexploded ordnance, and time constraints imposed by working on a live firing range! Numerous agencies and individuals were involved in setting it up, and we were delighted when the project won the annual Sanctuary Award, given each year for the best conservation project on the MoD land. A general view of the excavation showing the six excavated areas and ‘control’ baulks left after the machining. These baulks will eventually be removed after the sections have been drawn. Jessica exposing the remains of a badger-disturbed skeleton. There are early indications that this might be a late burial because it cuts through a layer of sand containing a large sherd of 12th century pottery.